The Marvel Universe we knew is dead. In its place is a new gestalt planet, stitched together from pieces of the preceding multiverse by the all-powerful will of Dr. Doom. This week, we’ll get our first real glimpses of the realms that make up Battleworld. Secret Wars is the summer publishing event that promises to re-make the fictional landscape where Marvel Comics’ superhero characters live. So far, longtime readers have been privy to the decline and death portions of the rebirth cycle, in the now-defunct New Avengers title and the just-started Secret Wars series. 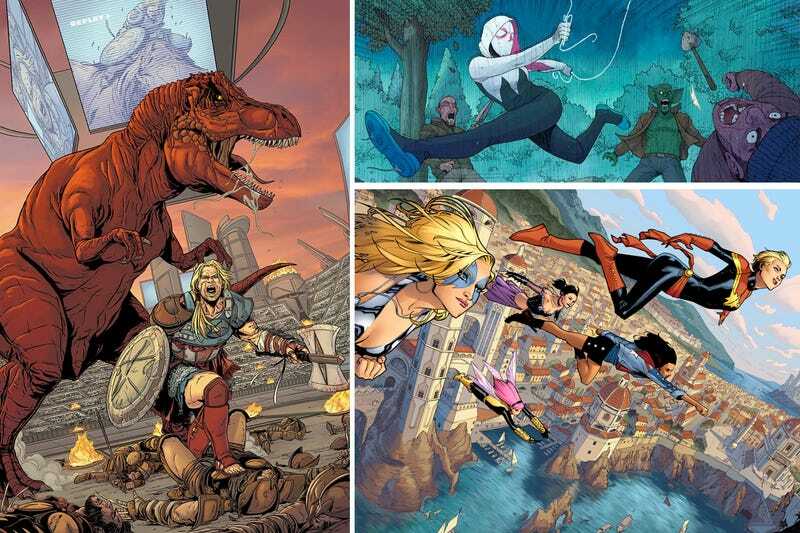 A collection of books tying into the event starts rolling out this week, with Spider-Verse, Planet Hulk and A-Force among the series that are first out of the gate. Consider them the chrysalis for the Marvel Universe that’s yet to come. The Start of the Next Marvel Universe Is... What the Hell Is Going On? Part of the hook for these satellite series is that Marvel’s already said some of them will be carrying over (like A-Force) to the new, reconstituted mainline universe that shakes out once Secret Wars is over. But the first issues of Spider-Verse, Planet Hulk and A-Force work on their own. In each book, fragments of the old worlds linger. This new patchwork reality is most interesting in how each book’s creators choose to use those echoes. In Spider-Verse—by Mike Costa and Andre Araujo— we see the Spider-Gwen version of Gwen Stacy dealing with a nagging sense that existence is off. She stares at her grave, unable to avoid the fact that she isn’t alive in some reality somewhere that’s crashed into hers. Peter Parker’s gone missing in this reality but other Spider-heroes show up to fight crime and wonder at the anomaly of them being all in the same place. Norman Osborn still exists, though, and Gwen invents a secret identity so that she can work for him, in a bit of counter-intuitive logic, to hack his information network. What she finds is an arachnoid ally that doesn’t seem to fit in at all in this tangled-web world and a bigger mystery about what Norman Osborn knows. The green-hooded god of Battleworld doesn’t show up in Spider-Verse. Doom’s dominion hovers more heavily over A-Force and Planet Hulk, where re-imagined heroes run afoul of the monarch’s rules. Written by G. Willow Wilson and Marguerite Bennett with art by Jorge Molina, A-Force opens up with the titular all-female team already in existence. This is a legion of heroines long used to the scheduled patrols and teamwork necessary to keep the island of Arcadia safe. But when Young Avengers’ America Chavez throws a giant megalodon over the island’s borders, she herself gets thrown into exile. Her housemates Loki (in a previously-seen female form) and Sister Grimm (a.k.a. young witch Nico Minoru from Runaways) rage at the injustice handed to Miss America but the characters in A-Force aren’t heavily remixed. There’s one or two instances of speech patterns getting slanted in a more courtly mode but, by and large, these are characters have their recognizable personalities. Planet Hulk is the least familiar of this initial Battleworld crop. As the title implies, there’s not just one Hulk in the realm of Greenland; hundreds of green-skinned behemoths stalk the land. Yet, it’s a gladiator version of Captain America—with 1970s Marvel character Devil Dinosaur in tow— whose story we wind up following. In the comic made by writer Sam Humphries and artist Marc Laming, we meet a Steve Rogers who’s mourning missing-in-action partner Bucky Barnes. He staves his own death sentence from Doom by reluctantly agreeing to go into Greenland on an assassination mission for the throne, with the promise that he’ll find out the fate of Bucky in the process. first issues that readers will want to know what the histories of these realms. It’s a good omen for the coming deluge of tie-in books that will flesh out the world of Secret Wars.